As an individual with an entrepreneurial spirit, you know you have options when it comes time to start your own business. If you are looking at a ProSource® franchise and are like most of our franchise owners, you are already involved in business, whether you are an executive of someone else’s company, or own a private home improvement business. Regardless of where you are in your career, if you are considering starting a business, one of the most important questions you will ask yourself is, do I want to start my own business, or do I want to open a franchise? As one of the best franchise opportunities in the country, we are clearly biased. 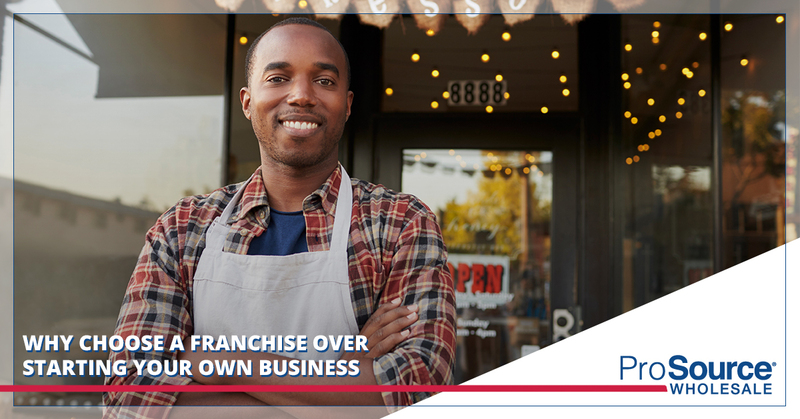 Still, we are compelled to tell you all the reasons why it’s better to invest in a franchise than try to start your own small business. First and foremost, what leads to the failure of most businesses is lack of capital. To open a ProSource showroom, we do have an expectation that you have a net worth of $1,000,000 and liquid capital of $250,000, but being in this financial position does not mean that it will be sufficient to start your own business. In fact, most small business owners go into debt. When you own a franchise, in contrast, you are able to grow your business with our resources. This significantly reduces your risk of debt and the cost of equity, making franchising a more financially practical choice. Anytime you are starting a small business, it takes a while to get off the ground. You might have an innovative concept for your business, but as you slowly grow, your competitor comes in with more resources and beats you in the market. The trouble is, growing any single unit takes time. Franchises address this issue by immediately providing you with all the resources you need that would take years to acquire for a small business owner. You are better able to compete in the market because you have all the financial and human resources necessary to saturate the market before your competitor does. Because we offer a proven business model, our franchise is run in a highly profitable manner. We have a system that has proven replicable and has helped hundreds of business owners to succeed. When you start your own business, you don’t have the data necessary to know that the way you are running things will be profitable. With ProSource, you can feel confident in your ability to thrive in the marketplace, a comfort that people who work outside the franchise business model cannot achieve. Startups have a very low success rate: 50 percent will fail within the first five years. Franchises are more advantageous because they don’t come with the trial and error that single unit businesses do. You have an effective model that has proven over and over again to be an enduring business; it requires significantly less risk on your part. When you start your own business, no one knows you from Adam. When you open a ProSource franchise, you benefit from our stellar reputation in our market niche. Trade professionals know the ProSource name, and that they can rely on us for quality products at affordable prices, so you don’t have to struggle to get your name out there when you begin your business. If you are a self-motivated, business-minded individual with a desire to break into the booming home improvement industry, we would be very interested in speaking with you. Contact ProSource Wholesale Franchise today to get started.